These are the Common Core Weekend Reads for Mother’s Day, 2015. Please note: Compiling and producing the CC Weekend Reads over the last year has been a useful tool for many including myself. However, due to time constraints, family obligations and other projects I cannot continue to keep these posts up. This edition will be the last installment of the Common Core Weekend Reads. I will be continuing to cover the NC Academic Standards Review Commission and Common Core topics in North Carolina. Next ASRC meeting: May 18th. Details here. NC UPDATES: Event Alerts below! CCSS, Come to Raleigh and Meet Your Match! Wake Cty Parents Worried About Common Core? Get Involved. ARNE DUNCAN: So to be clear, states are supposed to work with districts on that, and we’ll look at the numbers and whatever, and we think that most states will do that. But if states don’t do whatever, then we have an obligation to, uh, to step in. 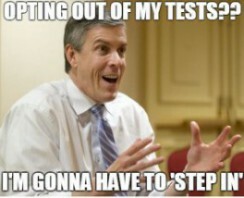 State-Led Myth Nuked By Duncan Himself: Opt Out and Fed Will Have To ‘Step In’. Educational Equity: Does it Lower Abilities & Standards in Order to Level Playing Field? Has Our Education System Become The Post Office? This entry was posted in Common Core, LL1885, The Articles and tagged Common Core, Weekend Reads. Bookmark the permalink.